Within the Dispute Resolution practice area, it is partner Kina Chuturkova ranked in Band 1 that remains a towering figure in the Bulgarian market, advising an impressive roster of clients featuring banks, construction companies and manufacturers. She is well versed in international disputes as well as cases before local courts. Market observers recognise her for her attentiveness, with one describing her as a "great lawyer, very diligent." Partner Yordan Naydenov in the prestigious Band 1 ranking as a leading lawyer in the corporate sphere. Interviewees are full of praise, with one noting:"Frankly speaking it's been a pleasure, it's always a pleasure to work with him." Considered "one of the best Bulgarian litigators," Kina Chuturkova is well versed in civil and commercial litigation as well as domestic and international arbitration, utilising her long-standing experience as a former judge. She represents clients across a range of sectors such as energy, banking and construction. Clients appreciate her co-operativeness and say: "It is very comfortable to work with her." Alexander Chatalbashev regularly advises on corporate transactions and projects in the Bulgarian market. He is noted by sources for his experience in the gaming and gambling sector. Yordan Naydenov receives praise for his experience across M&A and financing matters and his "excellent understanding of how transactions should work." He frequently advises clients in the banking and real estate sectors on local transactions and restructuring issues. Managing partner Borislav Boyanov is "a great strategic thinker" who is highly regarded as a "top name" in this area. He regularly advises international investors looking to enter the Bulgarian market. Damian Simeonov is noted for his work in M&A and financing transactions in the TMT sector. He also regularly advises clients on their TMT regulatory issues. Head of [the Tax] department, Yordan Naydenov acts for clients in the field of real estate and corporate taxation. He also advises on the taxation of the acquisition and disposal of assets. Market commentators admire this "very good" team, particularly highlighting the department for its "depth of experience." Clients are "very satisfied" with the team's support. Interviewees report that the firm "has a good practice" in the area and add that it is a "strong tax practice" with "good tax lawyers." Ralitsa Nedkova is experienced in enforcement proceedings, refinancing matters and loan restructuring mandates. She advises a range of clients from sectors including telecoms and real estate. Widely appreciated for her litigation expertise, Kina Chuturkova is recognised for her activity in contentious matters and insolvency proceedings. She is well versed in representing domestic and international clients active in the banking and real estate sectors in insolvency matters. Damian Simeonov is recognised for his restructuring work, aided by his exceptional reputation in banking and finance matters. He regularly represents banks, real estate developers and telecoms companies in their refinancing projects, loan restructurings and enforcement procedures. Head of [Real Estate] department Nickolay Nickolov is one of the best and most experienced real estate lawyers in Bulgaria, advising on a wide range of matters including acquisitions, disposals, due diligence and leasing. Sources say he shows "very good attention to detail" and is "a great negotiator." Clients appreciate how the team handles stressful situations, with one client noting that "the real estate team had a very calm demeanour about them throughout negotiations and drafting, which led to results even when things got agitated." Often representing clients in front of the courts, Kina Chuturkova is described by peers as an "excellent litigator." She has additional expertise in trade mark oppositions and in anti-counterfeiting topics, including customs seizures and related criminal proceedings. "They have a deep understanding of our business needs and provide very thoughtful, deep analysis," says one client. "They answer all of my questions at the appropriate level of detail," reports another impressed interviewee, going on to say: "The lawyers are very responsive." Head of the energy and natural resources department Alexander Chatalbashev is "an excellent energy practitioner" with experience in handling M&A and corporate matters as well. A market commentator reports: "His work in the energy sector is outstanding." An interviewee reports: "They always react promptly and at a very high-quality level, and their advice is hands-on and practical." A source calls the team a market leader, noting: "They have broad knowledge of all the energy fields." Violeta Kirova acts for a wide range of clients in sectors such as finance, education and manufacturing. Clients say she is "very knowledgeable on local employment legislation," while further sources appreciate that "she is very co-operative and it is easy to work together with her." Kirova assists with a range of transactional and employment litigation mandates. One client says that the lawyers "are very supportive and quick," while another notes: "They always answer on time and exactly address the questions I have asked." Additional sources appreciate the commerciality of the support: "They always manage to pinpoint the issue at hand and provide coherent and business-oriented advice." Sources appreciate the clarity of the advice offered by the team, adding: "They are very efficient and very fast." Additional interviewees highlight the firm as "one of the biggest and most reputable" in the Bulgarian market, also emphasising its international network of legal partners. Interviewees value the department's prompt and high-quality responses. They say: "Their advice is hands-on and practical." Sources also describe the team as a "high-class outfit" with "the best depth of experience in the market." The "outstanding" Peter Petrov is known as "one of the best lawyers in the market" by peers and clients alike. He acts for a range of clients in industries such as energy, aviation and retail on merger control proceedings, competition disputes and state aid matters. Appreciative clients describe him as "very erudite" and say that "his work is characterised by detailed project analysis and information." "We highly appreciate that the legal advice given is timely, in-depth and analytical," says one impressed interviewee. Further sources report that the lawyers "have a wide view on the matters and a lot of experience." Ralitsa Nedkova offers expertise in bank loans, acting for both lenders and borrowers, and bond issuances. Svetlina Kortenska is well versed in banking and capital markets regulatory matters. She often assists with syndicated financing mandates. Damian Simeonov offers notable experience in loans, regulatory matters, bond issuances and NPL transactions. Impressed interviewees highlight the lawyers' fast responses: "They always react promptly and at a very high-quality level. Their advice is hands-on and practical." Further sources praise the team's reactivity and say the firm "has been very responsive, and has an excellent knowledge of the financing market in Bulgaria." “What we mostly appreciate is the combination of business and legal aspects”. “Very good, very highly respected, slightly bigger than many competitors, slightly more polished and professional,” says another client. “Very pleased, good networking with relevant institutions and very good expertise in competition law”, says a client who liked the fact that the firm is very “business oriented”. “A well-built, impressive team, which is consistent in its advice and manages expectations well." "Boyanov & Co’s ‘quick and responsive’ real estate and construction team is praised for its ‘clear and effective’ advice." "Boyanov & Co’s ‘outstanding’ TMT team continues to advise RBS on its €1.4bn loan to AIG for the acquisition of a majority stake in Bulgarian Telecommunications Company (BTC), and recently advised Telefonika on regulatory matters regarding a resale of telecoms services." "Boyanov & Co’s ‘committed team’ provides ‘excellent response times’." "Boyanov & Co’s ‘fantastic, first-tier practice’ and is expert in renewable energy and nuclear matters." "The ‘first-rate’ Peter Petrov heads Boyanov & Co’s ‘quick and effective’ team." "Boyanov & Co’s ‘professional, efficient and friendly’ team is representing the Bulgarian subsidiary of Dundee Precious Metals in a Supreme Administrative Court case, and acted for Minerali Industriali Bulgaria and Mineral Resources in an insolvency case regarding claims for more than €2.5m." "Boyanov & Co’s ‘thorough and detail-oriented’ team pairs ‘knowledge of the law’ with an ability to provide ‘clear solutions’." "Boyanov & Co’s ‘very experienced’ capital markets team is advising Bank of America on Bulgarian law matters relating to its corporate card programme in Europe, and assisted Wells Fargo with a survey of regulatory requirements, products and services in Bulgaria." "Boyanov & Co’s ‘knowledgeable’ group provides ‘a first-rate service’." Boyanov & Co’s experienced team provides "quick response times, excellent industry knowledge and strong commitment to its clients". Boyanov & Co provides an "excellent" service to its international client base. It is particularly strong in the nuclear and renewable energy sectors. "Boyanov & Co advises across the full spectrum of work, and is notably expert in banking and project finance." The firm’s brand holds a lot of clout, as one client says: “They are one of the biggest and best known in the market. They can give advice in a lot of spheres beyond strictly legal. This is very important in Bulgaria”. "Clients praise the “high-quality advice received” from this team. " "This top-tier practice is valued for its “ability to handle the most complex mandates”." "Boyanov & Co’s comprehensive competition practice matches “the best of the best”." "Boyanov &Co has a strong TMT practice that is noted for its ability to advise on big-ticket deals." Certificate of Appreciation presented to Nedyalka Novakova in appreciation of Ms. Novakova’s contribution to Doing Business 2013: Smarter Regulations for Small and Medium-Size Enterprises, a co-publication of The World Bank and the International Finance Corporation. Certificate of Appreciation presented to Dr. Nikolay Kolev in appreciation of Dr. Kolev’s contribution to Doing Business 2013: Smarter Regulations for Small and Medium-Size Enterprises, a co-publication of The World Bank and the International Finance Corporation. Certificate of Appreciation presented to Yordan Naydenov in appreciation of Mr. Naydenov’s contribution to Doing Business 2013: Smarter Regulations for Small and Medium-Size Enterprises, a co-publication of The World Bank and the International Finance Corporation. "Boyanov & Co.’s ‘experienced, reliable, and highly regarded’ three-partner team [of Real Estate and Construction] is led by the ‘thorough, professional and responsive’ Nickolay Nickolov." "Boyanov & Co provides an “excellent” service to its international client base. It is particularly strong in the nuclear and renewable energy sectors." "Boyanov & Co.’s comprehensive competition practice matches ‘the best of the best’." "Boyanov & Co’s experienced team provides “quick response times, excellent industry knowledge and strong commitment to its clients”." "Headed by the highly regarded Damian Simeonov, Boyanov & Co.’s team has an excellent reputation for capital markets." Certificate of Appreciation presented to Yordan Naydenov in appreciation of Mr. Naydenov’s contribution to Doing Business 2012: Doing Business in a More Transparent World, a co-publication of The World Bank and the International Finance Corporation. Certificate of Appreciation awarded to BOYANOV & Co., Attorneys at law in recognition of their outstanding service to Catholic Relief Services for divestiture and localisation legal services in Bulgaria. “Offering a ‘very blue-chip service’”. "Clients speak of the “excellent services provided by the firm”. One client added: “I was very impressed – the lawyers are switched on and understand EU legislation.”"
"This is undoubtedly the foremost practice around," agree sources about this major market player. "It's without question the best team to engage in Bulgaria.". The Firm stands alone as the only Band 1 law firm in Bulgaria. "The firm is ranked as “well renowned and highly visible” in the technology, media and telecommunications field for its ability to “handle commercial, regulator and technical matters”." "The firm is also known for the “market leading quality” of its practice." "The firm now “plays a central role in the reshaping telecom business in Bulgaria”." "Borislav Boyanov & Co. has been a “heavyweight telecoms player since it was involved in Bulgaria’s first attempted telecoms privatization back in 1997”." Ranked first tier as having a “well-deserved reputation for reliability and quality”. “Borislav Boyanov & Co boasts a large client portfolio”. “The team is praised for its focused approach and ability to ‘serve the interests of the client, as opposed to arguing pointless legal arguments’”. “‘the professional and competent’ Borislav Boyanov & Co’s banking practice advises an impressive roster of domestic and international financial institutions across the full spectrum of transactions, from regulatory compliance to big-ticket financings”. “Well respected across a broad range of finance areas albeit with particular expertise in banking-related advice”. “Described by one top corporate client as “among the market leaders”, the firm has been on one side or the other for most of the large Bulgarian financial institutions”. “Offering an excellent service with extensive experience in banking and finance matters”; “clients praise the team’s accommodating service and prompt response times”. Ranked first tier as being “knowledgeable and effective”. 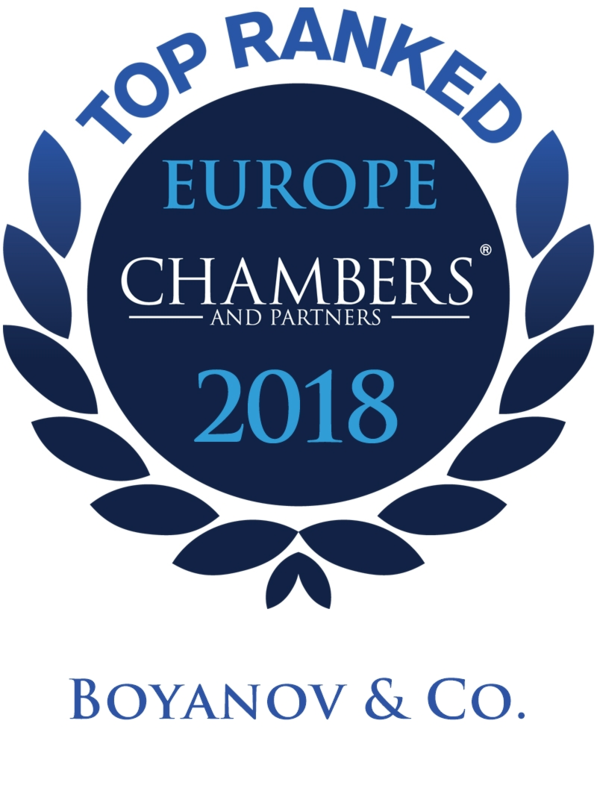 Chambers Europe ranks Borislav Boyanov & Co. Band 1 in Employment. “Violeta Kirova is renowned for her skillful handling of a number of high-profile cases, and works closely with many large companies”. “This leading firm focuses strongly on litigation and employment matters, frequently advising on various aspects of employment law such as the restructuring of organizations and mass redundancy issues”. “Borislav Boyanov & Co’s ‘very focused and pragmatic’ 12-lawyer practice is one of the few outfits in the country with the capacity to handle big-ticket M&A mandates”. Legal 500 ranks Borislav Boyanov & Co. in Tier 1 in Corporate and M&A. PLC Which Lawyer names Borislav Boyanov & Co. as “Leading” in Corporate and M&A. Chambers Europe ranks Borislav Boyanov & Co. Band 1 in Competition/Antitrust. "This full-service “great firm” is cited by clients and peers as one of the leading practices in the banking and finance arena." 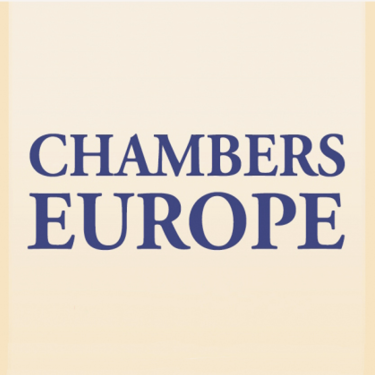 Chambers Europe ranks Borislav Boyanov & Co. Band 1 in Real Estate. "Interviewees are impressed by “an excellent team of young, deal-tested lawyers, who successfully employ a Western approach.”"
"Clients in turn highlight that lawyers “are also aware of international trends, which is extremely helpful for us.”"
"Peers praise the firm’s “excellent technical skills and exceptional in-depth understanding of the Bulgarian business environment.”"
"Sources note the firm is “large enough to have people specialising, which is still rare in the Bulgarian market and definitely a strength.” Peers praise the firm’s “excellent technical skills and exceptional in-depth understanding of the Bulgarian business environment.” Clients in turn highlight that lawyers “are also aware of international trends, which is extremely helpful for us.” Interviewees are impressed by “an excellent team of young, deal-tested lawyers, who successfully employ a Western approach.”"
Chambers Europe ranks Borislav Boyanov & Co. Band 1 in Corporate / Commercial. "Offering an excellent service with extensive experience in banking and finance matters." Throughout the years Boyanov & Co.’s commitment to excellence has been recognized by virtually all international publications, reviewing the legal market in Bulgaria. Since 2000, Chambers has invariably ranked Boyanov & Co., in the first tier as one of the leading law firms in Corporate law in Bulgaria. Ever since installing specific rankings in these fields Chambers Europe positioned Boyanov & Co. at the first tier in Competition/Antitrust, Employment, General Business Law, Real Estate, Banking and Finance, citing accolades by clients and piers alike. Boyanov & Co. was declared M&A Law Firm of the Year for Bulgaria in the 2009 edition of the ACQ Finance Magazine Law Awards. Guided by the poll's results the editors of ACQ have selected those firms which had the greatest impact on the industry in 2008 / 2009. 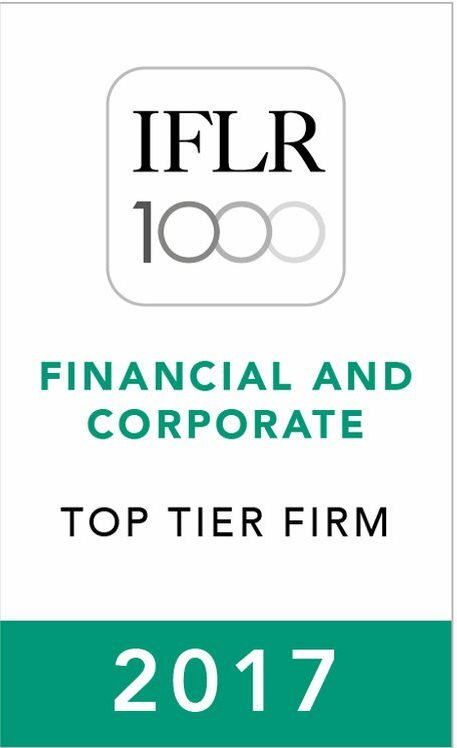 Since 2002 the firm has consistently received recognition from IFLR 1000, being placed in Band 1 in a variety of practice fields, including Banking and Capital Markets as well as in the Mergers and Acquisitions. The guide commends the firm for being “one of Bulgarian’s most renowned banking and finance advisers with a strong portfolio of local and international clients” and also recommends it for “its solid M&A work”. 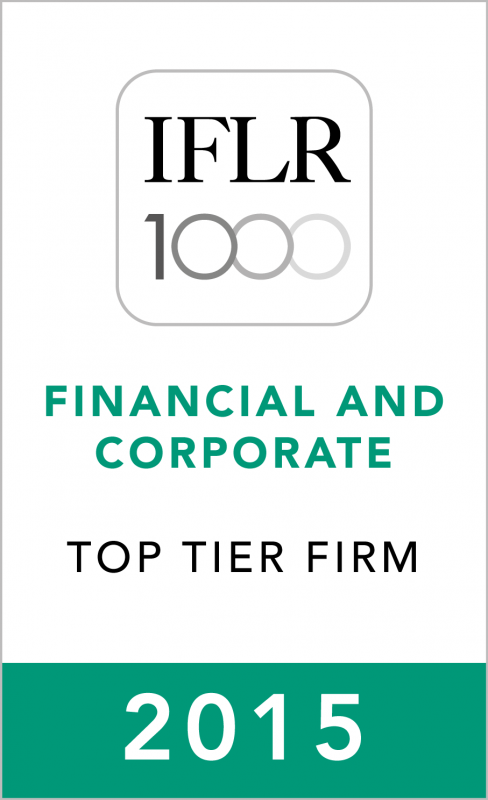 For 2009 the firm occupies the top position of the reviewers’ ranking in the area of Finance and Corporate, quoting client opinions of the firm “being one of the best in the Bulgarian legal market”. 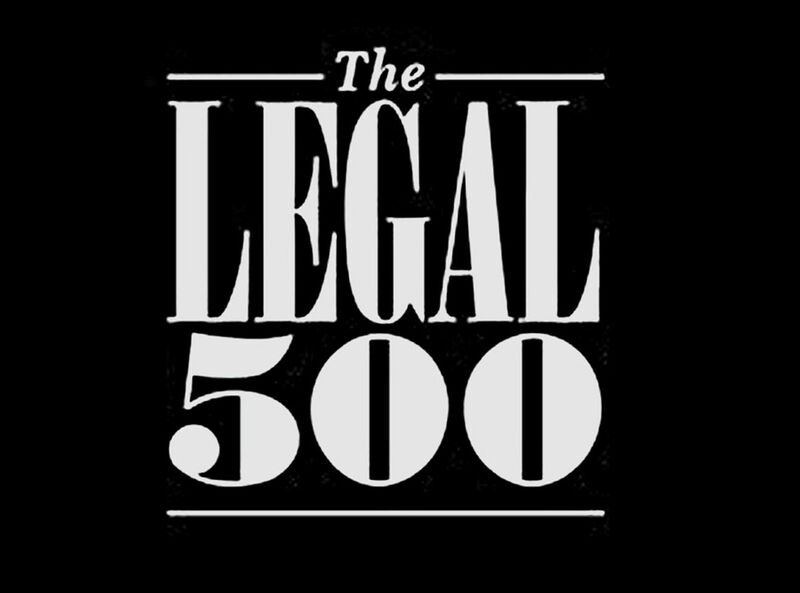 The Legal 500 already in 1996 recognized Boyanov & Co. as one of the leading law firms in the market. The firm received from the Legal 500 highest rankings for 2004 and for 2006-2009 in Banking and Finance, Capital Markets as well as in Corporate and M&A. Boyanov & Co. has also been recognized as a leader in the areas of Project Finance and Construction and also in the sector of IP, IT, Telecoms and Media. Boyanov & Co. keeps its leading position also in 2009, according to Legal 500’s research, also in EU and Competition as well as TMT. A number of professionals of the firm have been recognized by The European Legal Experts guide as being highly recommended in their particular areas of practice. The leading position of the firm in the areas of Banking and Finance and in Corporate/M&A for 2006 – 2009 has also been recognized by the PLC Which Lawyer directory where the firm is classified as “leading” and “highly recommended” in each of these fields. For 2008-2009 Boyanov & Co. is not only a leader in the Banking & Finance and Corporate/M&A areas, but also in the Competition/Anti-trust and Real Estate sectors.